You may wonder where Philips Electronics, the company that makes reliable TVs, close-shaving razors, and innovative light bulbs, is going these days, now that it's been recognized as a fashion innovator by Time Magazine. (November 12, 2007). Experimenting with futuristic concepts, Philips is enlisting the public's involvement, an innovative strategy designed to beat the invention failure rate. Quoting statistics from a 2005 article in Business Week that "up to 96% of all new projects fail to meet the targets for return on investment," Philips questions the linear business structure that identifies and moves an innovation through a pipeline. Should an innovation be pressed through an internal pipeline or allowed to simmer, be sampled, added to, matured into something that is really perceived as a need by society. To find out, Philips is offering its innovations to "society" for feedback and discussion. 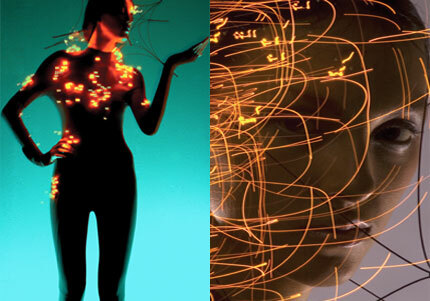 The dress above is one of two designs Philips created as a prototype of how electronic textile development can react to subtle changes in the skin. A second design, the Blubelle dress (see Phillips’ Emotional Sensing Dress) won Time Magazine's favor in the Fashion category of the 2007 awards for best invention . The Vibe necklace picks up a variety of biometric signals that can be picked up by other wearers of the necklace. This is achieve by a combination of conductive ink and textile sensors. A wireless, stick-on sensor forms this jewelry's special attraction . As Philips writes: "It explores a range of functionalities in new product forms that are playful, sensual, mood affected, bio activity stimulated, and arousal enhancing. It is a semi disposable, bio compatible, non-allergenic, breathable, mass customizable, self contained body worn accessory." 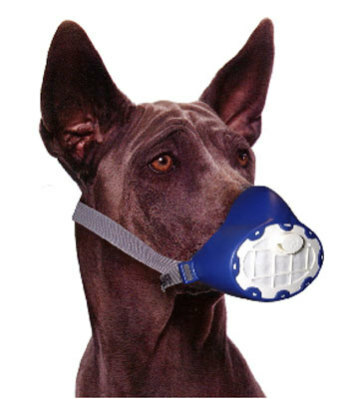 In this image, a dog is wearing a prototype of a mask designed to detect illness in humans by elements in their body odors. Dogs are being trained to detect humans with cancer, so perhaps some of the eventual technology will be derived from learning more about dog's sensing abilities. The object of this smell device, though, is to enable humans to identify illness in each other. Humans are strongly affected by smell anyway... either attracted or repulsed by it. Philips brought this bit of information out on its website that I thought I'd share with you: "Tests have shown that women can identify the most genetically suitable partner for reproduction purely on the basis of smelling a T-shirt he has worn." Taking a shower in 2020? This Design Probe is the most ambitious for it aims to create an environment where light, air, water, and waste interact with a live environment... buildings and homes, for example, that respond to their environment. The goal is that a new approach to building and building materials would conserve the earth's already dwindling resources. Philips has more pictures and an interesting short video on the sustainable habitat page that I recommend you visit. The open model of development represented by Philips' Design Probes suggests a very cooperative innovation process; indeed Philips has already partnered with other organizations to work on the Design Probes. It does seem that there would be fewer needless products coming to market and failing, less waste of inventory and packaging, and more of a positive global impact from innovation. How should the independent inventor structure his innovation pipeline? Let us know your ideas in the comments section below. This Christmas, Give the Gift of... Snow? Sustainable Habitat 2020 - Interesting! I hope that the might that is Phillips follows through with research and funding to help realise the sustainable dream. We as a race have completely lost touch with our environment and values. We really need to re focus on what is important before it is all gone for good. The rates we are currently consuming energy is no longer sustainable. Our whole concept of energy needs re-evaluating, Micro CHP (Combined Heating & Power) Solar PV, Wind Turbines all need integrating into all new builds. Our current technology allows us to be Off-Grid, sustainable & carbon neutral. Forget the dream of cheap energy, energy is not Cheap especially renewables. Let’s begin by preserving and minimalising the energy we waste and go from there. I don't have anything to say except i don't understand what this means so can you please tell me i won't care about it for what ever it is.